5 Reasons to get your scuba equipment serviced regularly which could potentially save your diving days while on vacation. If you’re an avid scuba diver then you know how important your equipment is. We always know it will be there when we need it, and when our trip rolls around we grab our bag and hit the water. It allows us to explore the oceans below the surface and get us up close and personal to the beautiful sights. And just like good dive buddy, our scuba equipment is always there for us. But are we always there for our equipment? Do we really need to service our gear even though it seems to work just fine? Let’s find out, shall we. Here’s a few reasons why servicing your equipment is vital to your enjoyment of the sport and longevity of your gear. Whenever you purchase a BC or regulator, the manual will clearly indicate how often that piece of equipment should be serviced. The most common timeframe would be on a yearly basis but some manufacturers may suggest different periods of time. Why do they want you to service your kit? Because while they do trust the quality of their product, over time internal pieces can wear out and must be replaced. 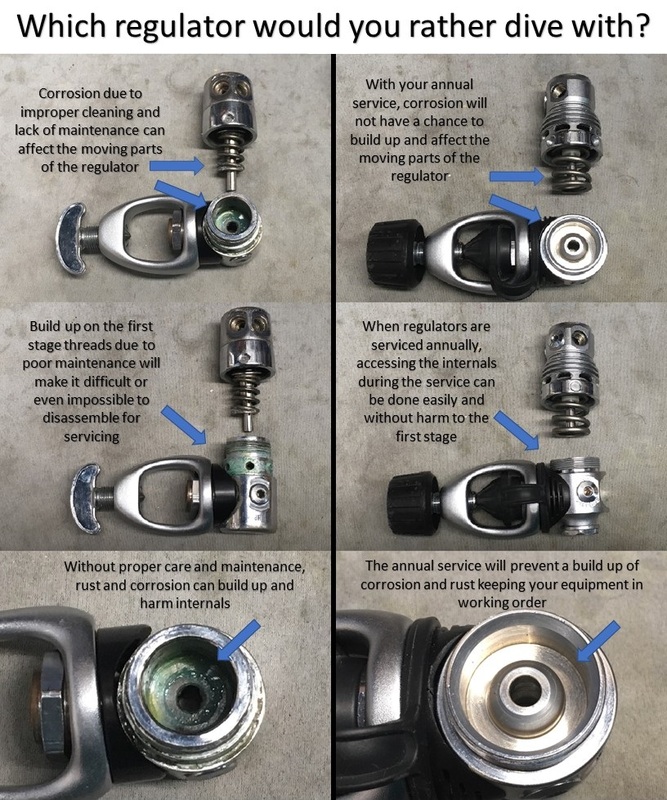 This is why all manufacturers want you to visit your local dive center to have your equipment tested and serviced so it’s in tip top shape. The adage that “an ounce of prevention is worth a pound of cure” is as true today as it was when Benjamin Franklin made the quote. And while he certainly was not referring to scuba equipment, we can apply that same truth. Just like basic maintenance with your vehicle, basic maintenance with your scuba equipment will extend its life considerably. Imagine if you didn’t change the oil in your car. Sure, it will still run and after all out of sight is out of mind. But how long will that car last? Let’s face it, fluids get old and dirty, parts get worn out and if you don’t do the basics your car’s engine could seize which would mean you would need a new engine. The same basic principle applies to your scuba equipment. The internals of your equipment can get dirty and corroded which can cost a fair amount to get it repaired or replaced. There’s a lot of money that can be saved in the long run and while we can certainly sell you a brand new piece of gear, why not save the money and go on an amazing dive vacation? After you service your equipment of course. One of the main reasons why we love diving is that we get to relax underwater and take in the beautiful landscapes, marvelous reefs and gorgeous marine life. And the only thing we should worry about is whether or not we’ll make happy hour after the dives. We really don’t want to have that lingering feeling of “maybe it would have been a good idea to have our equipment checked out prior to the trip” just as the boat leaves the dock. Our equipment should be the least of our concerns so why add a stressor to our adventure? We’re here to have fun after all. Like it was mentioned earlier, our equipment is like buddy that we can rely on no matter what and there is nothing like having the confidence that your gear will be ready to go when you are. Especially when something amazing decides to show up on that dive. We’re all familiar with Murphy’s Law, but I’d like to think that Finagle’s Law is a bit more appropriate to us as divers as it states “Anything that can go wrong, will—at the worst possible moment.” That old hose on your regulator finally starts to leak just after your boat arrives at the dive site, your computer battery dies in the middle of a dive, your regulator starts to free flow and you can’t make it stop no matter how many times you tap it, your inflator begins to automatically inflate your BC just before your giant stride and you can’t get it to stop. We have all been there. And that’s why we should always get our equipment serviced when it’s due. During the annual service, hoses are checked, batteries can be replaced and regulators will be cleaned and put back into factory specifications. We don’t want to let something like basic maintenance keep us from enjoying the sport we love. Let’s be real, some of us are fair weather divers and there’s nothing wrong with that. Warm water and warm weather are what we love to dive in and sometimes the cooler months keep us out of the ocean. But that doesn’t mean that it has to keep us out of the diving world. Getting your equipment serviced will keep you in the game by getting you back into the shop and chatting with other divers. We can still be in the diving mood by looking at the new gear, checking out the new trips and taking a few new classes. Getting your equipment serviced will also incentivize you to keep diving when the water warms up. After all, you can’t let serviced equipment stay dry for too long.